March 1st is a day that will forever be the day that my world changed. On that day, I learned about my child’s other life. I learned that my happy, healthy, smart, outgoing, talkative, always smiling, never in trouble, nothing out of the ordinary child wanted to die. And not only did my child want to die, but said child had actually attempted to, twice. During the next 48 hours of my life, my world was completely upside-down. Like many parents, I thought it was a joke. I thought it was something that was said to, maybe, get attention, or a strange way to try to fit in, but it wasn’t. It was something entirely worse. Within an hour of talking I was wishing I had a do-over and I could go back to the hope that my child was “lying” about these thoughts instead. The reality was a slap in the face. It was almost eighteen years of parenting mistakes playing over and over in my head. My husband and I were floating in a sea of confusion, blame, guilt, and fear. Total FEAR! You never truly know fear as a parent until you find out your child has been near death — or playing with it for that matter. After the initial shock wore off, we enlisted the help of our tech savvy oldest child to help us look through said child’s tablet. It was clean. Nothing out of the ordinary on it whatsoever. No social media apps. No strange searches. No unusual pictures. All looked “normal”, or as it did when we did our random check a month earlier. This time though, we started thinking about things as a parent of a child who isn’t well. How could that same child have a completely parent-approved history, no unapproved apps, no social media? It was too clean. It was too normal and all of this had to stem from somewhere. It was somewhere around 2 am when we found a cell phone. An old phone my child insisted they didn’t have anymore. A phone that we hadn’t seen in months. Two minutes in and my oldest said he shouldn’t be helping us anymore. He found social media accounts with aliases (all in real life friends and family were blocked), he found pictures, he found messages to and from pedophiles complete strangers. It was a gold mine for all things horrible and wrong. Said child had a complete suicide/depression cult following on a popular “global video community”. I couldn’t even look at my child. I was mortified. The other day I told you that I’ve said “I did everything right, how did this happen?” more times than I’d like to admit as a parent. This is that moment. I did everything I thought I was supposed to do. I didn’t allow said child on social media — at all! I don’t allow gaming chat with strangers. I monitor my child’s data usage and setup parental controls through my service provider. I had certain content blocked/censored on the known device itself. Let me say that again. When it comes to the internet, social media, parental controls, apps, etc. and your children, if you think you are doing everything right, you aren’t! If they know you are monitoring their devices, they will just hide the content, buy a cheap wifi ready device on their own, get a hand-me-down phone from a friend. There are so many ways children are hiding their real internet habits from their parents — it is mind boggling. Parenting today requires parents who don’t think they are doing everything right, but parents who are educating themselves and who are doing their best. Should be you be eating, sleeping, breathing, and stressing non-stop about the internet and your child? No. Should you move to an unpopulated state and unplug from the world? Maybe (teasing… kind of.) — No. But you can’t let your guard down. You can’t assume because you do random checks on their device that all is well. They are smarter than you can imagine. Remember, we parents are learning about smart devices more and more everyday, but our children are being raised with them. That’s totally different because for us we have to try to educate ourselves whereas this is all integrated into their entire being. It’s natural to them. A one year old can scroll to the app they want and play it! Social media to a tween/teen is just as normal to them as it was for us to jump rope or use a hoola-hoop! Don’t think for a moment that this is an issue with troubled kids or kids from certain backgrounds. My child was a model image of a happy child. Loving family. No trauma. Never been a troubled child. Never been a depressed child. Homeschooled so said child has never been bullied (in person). Child has the freedom to study and explore positive interests without ridicule. TRUST ME. I was hit out of nowhere by a lead balloon when I heard my child was suicidal. I thought the same thing. My child isn’t depressed. My child isn’t like that. My child wouldn’t lie to me or hide things. My child doesn’t do/behave like that. Like millions of other parents out there, I was wrong. Why are Kids Killing Themselves? Suicide is the second highest cause of death for teenagers and the statistics have shown a consistent rise in the past few decades. Just from 2007-now, suicide rate has risen by 70%. What is largely to blame? Social media. Children are completely being desensitized to death, self harm, and suicide on social media. It’s a common thing to say you want to die, to announce that to the world, and to follow through for fear of their social media persona being put in question– because they aren’t “being real.” Instead of celebrating that someone has made it through another day, comments are left on social media statuses insisting because the person didn’t attempt to commit suicide, they aren’t real. This all sounds completely crazy to us as parents; online nonsense doesn’t matter. Tune it out, blah blah. But to our teens. It’s real. It’s as real as being called out for failing to show up to a school-yard fight was back when we, or our parents, were kids. I’m trying not to show my age too much here, but am I making sense? to Self Harm and Suicide Online? Honestly, that’s impossible. It is impossible for parents to prevent our children from being exposed to self-harm and suicide online 100%. However, we can limit the exposure or discuss why they are looking at it, why they are watching it, why they are researching it. Download WebSafety on all of your children’s mobile devices, and you will be alerted in real time to when they are talking about, visiting websites, or viewing content that is concerning. Regardless if they are connected to the wifi at school, the wifi at a restaurant, or any other network. The information monitored by WebSafety includes all data accessed by the application, including apps downloaded, SMS messages, websites visited, location of device, and social media posts. For example, if your child downloads an app commonly used for Self Harm prevention, but you didn’t know your child self harmed, you would now be alerted that you need to go and talk to your child right away. If your child is researching “painless ways to commit suicide,” you receive an alert in REAL time. That alert can save your child’s life! I know there are a lot of parental control options out there, router level, through your internet service provider, through your mobile service provider. These controls are great and you should absolutely combine as many methods as you see fit, but they do a lot of preventing your child from reaching websites, turning off wifi at bedtime/school, and that sort of thing. They don’t give you real time alerts to what your tween/teen might be researching and they won’t tell you that your happy, everyday American child is researching suicide while you’re in another room. That’s the key difference. Because a lot of times, I’m awake while my child was up late — but I didn’t know there was a problem. Even if my teen used the hidden device, the tablet was also used to research suicide and things but my child was smart enough to delete the history to keep that device clean. If I had WebSafety installed, I could have been alerted months before the first suicide attempt. That’s months of emotional and physical damage I could have worked harder to prevent. I would give my right arm to have those months back and prevent my child from living this nightmare. Use the WebSafety app for 48 hours and leave a comment below letting me know how it went. Did you learn anything new? Is the child you see before you the same child online? Do you still know your child online? Available on Apple and Android devices, including tablets. ← FREE PRINTABLES! Grab These “Solo: A Star Wars Story” Color & Activity Pages! Your post took the breath out of me. I’m so sorry for what you discovered. As a parent I put myself in your position & can’t imagine going through what you went through. What happened since then? How can you help your children when they hide from you? How do you monitor a phone you don’t know exists? I hope you’ll share more. “How do you monitor a phone you don’t know exists?” That’s a great question. My oldest taught me how to look at our internet service provider to see what devices are connecting to our internet. Most of our known devices are named (Example: Mom’s phone, Sister’s Phone, Brother’s laptop, etc.). But early in the year we noticed a device was connecting to our internet late at night (3 am — when “everyone” was asleep). Alarmed, we thought a neighbor was hacking into our wifi so we beefed up our security codes, etc. and notified our Internet service provider. Turns out, the device that was connecting to us, was the phone my child had. I am working on a whole series of post on this so other parents can look at these things and recognize them as red flags. I never thought for a second that one of my children would have a device I didn’t know about. It just never occurred to me to look inward when the wifi useage was brought to my attention. As for the status of my child, said child is doing much better. We put a lot of things into place immediately; like 24 hour watch, moved said child into parents room so said child is never alone at night. We locked up all sharp/dangerous objects in the safe. We have a daily positivity goals (no depressing music, no scary tv/movies — positive influences only). Weekly therapy. There’s a lot — as I was preparing this post I noticed I needed to elaborate with future posts — I will certainly be doing that. I am thankful WebSafety helped me open the door to this discussion here on the blog. Thanks so much for stopping by, reading, and sharing your thoughts. 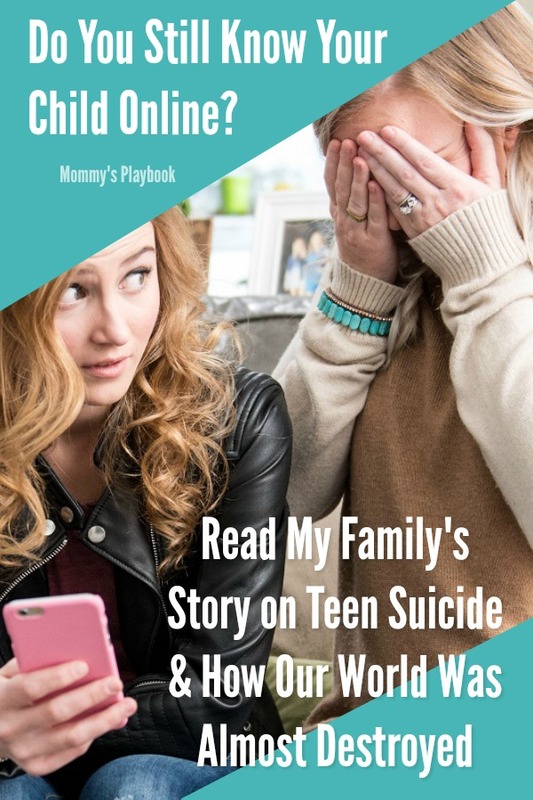 I hope you follow Mommy’s Playbook so you will receive update notices on Teen Suicide and how we, as parents, can recognize the signs in our otherwise “happy” children. Thank you for writing this post and opening your heart. While we haven’t gone through as much as you, our eyes have been opened. Parenting in this day and age is different. Challenging. I often wish we could go back to simpler times. I wish you healing, peace and strength moving forward. This is a real eye opener. It is also so sad. Thanks for having the courage to share it. wow, I was shocked reading this post. I know it happens, since my now 25 year old son put me through Hell with his substance abuse issues and brushes with the law in his teen years and back then social media was not as prominent as it is today. But wow, the length she went to to create an alias really stunned me and made me realize it is possible. My 16 yr old and I talk alot about stuff like that, she went through depression in junior high but thankfully overcame it although she still does have some anxiety. Wishing your family the best, thank you for sharing this! Makes me glad I never had kids. Wow, your post really stunned me. I’m a middle school teacher and have learned so much about the online lives kids lead….have been trying to keep a close eye on my own kids to try to avoid problems online. Thanks for bringing this to my attention!